The National Weather Service has canceled an Ice Storm Warning that was issued for much of North Texas. A cold front that sent temperatures plunging below freezing Tuesday is currently moving east. 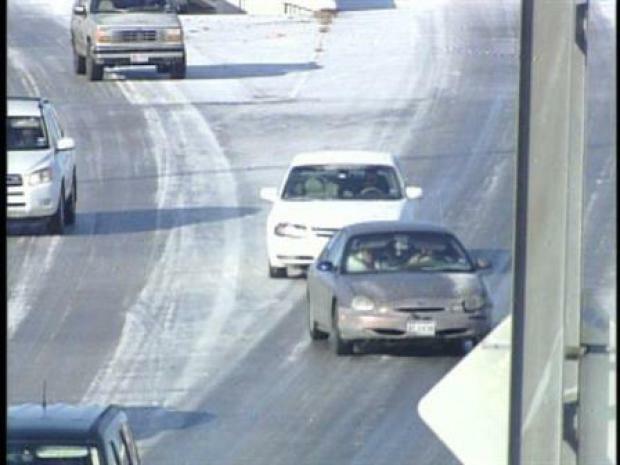 A quarter to a half-inch of ice was reported on some bridges and overpasses overnight. As temperatures drop Wednesday night, some fog may develop, meteorologist David Finfrock said. A few residual ice patches may still be on the roads for Thursday's morning commute. Stranded drivers try to make their way along icy roads in Fort Worth Tuesday morning. Drivers are encouraged to exercise extreme caution when on the roads, especially on bridges and overpasses. Drivers are also advised to allow extra time to reach their destination, maintain a safe speed and not slam on the brakes when approaching an icy patch. If you start to slide or skid, calmly steer in the direction of the skid to straighten the vehicle out and regain control. Motorists can get road information by calling 800-452-9292 or visiting http://www.txdot.gov/travel/road_conditions.htm. On NBCDFW.com: See school and business closings and delays. Travelers can click here to check their flight status.